Groundwater is a vital resource and one that can be used by rural communities in many parts of the world at relatively low cost. However, its benefits are undermined when borehole drilling is not done competently and professionally. 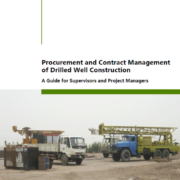 The Code of Practice for Cost Effective Boreholes provides a framework with which to raise the level of professionalism within the water well drilling sector worldwide. This project is part of the third phase of the Rural Water Supply Network (RWSN) Cost Effective Boreholes work – to support uptake of the Code of Practice. Nigeria, Burkina Faso and Sri Lanka as well as global. Raising awareness of the Code of Practice through a variety of media, and engaging with partner organisations and governments around the world. Moderated e-disucssion and webinar on the application of the Code of Practice with international participation.